Another guest blogger on An A to Z of Me is Kaz Hall. 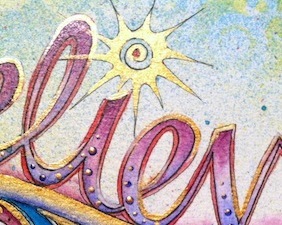 Here are some sneak peeks of her post. Do visit An A to Z of Me for further information. Next month I am starting a new challenge blog which you can join in with at An A to Z of Me. I love Valerie's style. You can find out more about her here. Do hope you will join in. and 10. Giving myself treats along the way. My biggest treat is that in the Spring I'm going to Florida for 10 days to stay with my lovely friends. Welcome to any new followers. I really appreciate you making the time to look in here. An A to Z of Me starts next month on this challenge blog. Only two more intention pages to go. I'm not at all sure how I'm going to portray intention 9 which is to spend a lot less time on the computer! I have been working on the backgrounds of several pages for the My Candy class. I was sure I had taken photos of the backgrounds for my two pages on photography but it seems I hadn't so it's straight into the finished page today here on my blog. In a previous post I showed you my list of intentions for 2013. I don't have any photo editing software other than the simple things available in Microsoft Office Picture Manager. I don't get on at all with Picasa and don't have the patience to learn Photoshop or Photoshop Elements. I did have a free piece of software from a magazine years ago which I used to produce the photo I have used for the stars on this page but I can't remember what it is called and I can't find it. Most photographs that I put on here are straight from the camera. Anyway, what I mean by Photo Manipulation in this instance is not the ability to distort something until it is totally unrecognisable like in these stars but to have photoediting that allows me to manipulate the mood or the angle of the photo. I am considering buying Lightroom. I had done some of the background for this page and I knew I wanted to either do stars or circles but couldn't decide how to arrange them. Then I read the DT post on A Sprinkle of Imagination and borrowed a few of the ideas. Thank you Trish and Vicki. However when I had finished the stars didn't really stand out so I used Pan Pastel to highlight round the stars. The second page is about Photo Inspiration. When I was doing a course called Creative Sketchbooks and before that C&G Creative Embroidery I used photographs to inspire my art or my textile art. And I've stopped doing that. Although I still take the photos of texture or line. So this year I want to use my photographs to inspire my art journal pages. On this page I used a stencil I made whilst doing Creative Sketchbooks which was made from a photograph I took in the garden. And here are the backgrounds for the next 2 pages on Challenge Blogs and Fitness. Hopefully I'll finish these pages soon. This is week 3 for both Journal Candy and Lifebook 2013. This week's class for Lifebook was from Christy Tomlinson. I did her She has 3 hearts class with her so knew that we were in for collaging in a big way. Firstly we had to collage and paint a background. And then make flowers to stick onto the background. I have made mine flatter than suggested because of being in a journal rather than on a separate peice of paper. While the various stages of the Lifebook page was drying I also worked on this week's Journal Candy class. This too was about collage. But this time to make a small zine. It's made from one sheet of A4 paper and ends up as a little book 10.5cms tall and 7.5cms wide. And this is it folded. I've really enjoyed myself today. And I am so pleased that I completed two activities. I probably need to go and have a lie down now! I often think about style and art journaling. And how to find my style. There are people whose work I admire who have a very distinctive style. What I've noticed about these pieces of work is that they are all brightly coloured and busy. Full of pattern. Dina and Roben-Marie frequently have areas of white on their pages but Dyan and Kate always paint every available space. Some other work I'm drawn to is Mary Nasser. Her work is all about maps. And then there are the faces! I don't do faces. But I love the art that Rachelle Panagarry produces. Oh and then there's text. 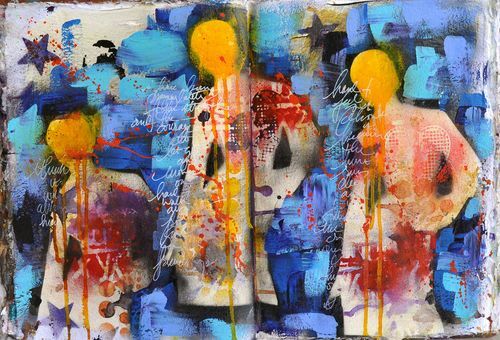 I just adore Valerie Sjodin's art journals. And yet, when I look at all the art journal pages I have pinned on my Pinterest board I can see a theme there. And it isn't brightly coloured and patterned. Although those pages are there too. When I'm reading Somerset Studio or the Stampington Art Journaling magazine my eye is drawn to anything neutral, duck egg blue, pastels, neutrals, peach colours. And yet more often than not my work ends up dark and messy and patterned and not what I had in mind at all. I am trying at the moment to only work with particular colours rather than randomly picking up what comes to hand. I think Dyan's new White Linen ink is going to really help me. I spend a lot of time on Pinterest and on websites looking at other people's work trying to find inspiration. But I often end these sessions feeling despondent. There are so many amazing people out there doing amazing artwork. And so I hesitate to start. It isn't that the blank page intimidates me. I never get as far as opening the sketchbook or finding the paper some days. So that's what I should be doing. Creating more. Have you found your style yet? There are lots of blog posts and YouTube videos about the latest craze - monoprinting with a Gelli Plate. This is a gel plate on which you put your acrylic paint and make patterns before smoothing a piece of paper over the top to take a print. I love how things come round again in the crafting world. At least 10 years ago I was doing monoprinting and producing handprinted papers. 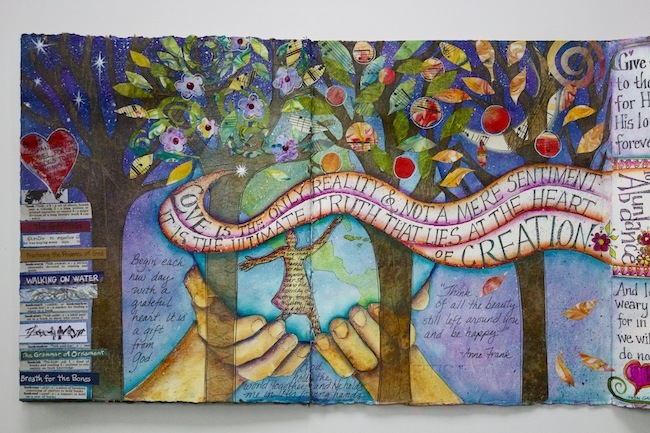 I attended a workshop with Ruth Issett based on her book Glorious Papers. 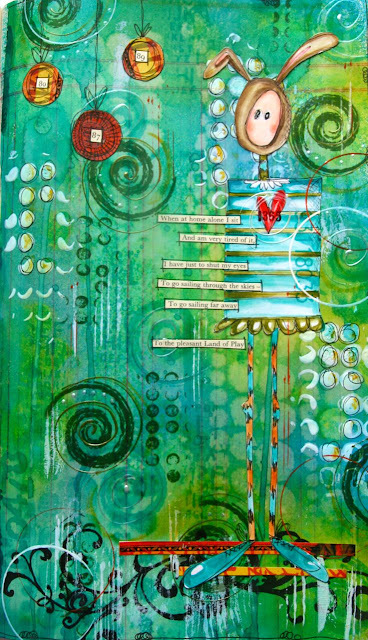 You can see the most amazing gelli plate prints on Patti's blog. And she also has made a video you can watch on YouTube. So what can you do if you don't have a gelli plate? I use a glass plate but you could use your non-stick craft sheet. You will need various colours of acrylic paint, a surface to put your paint on, a brayer, sheets of paper (try different sorts) and some items to draw with. 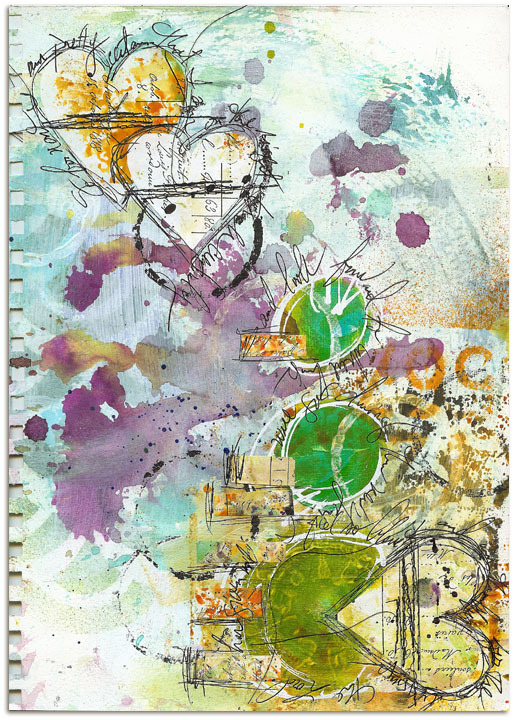 You can use the same things that are suggested for the Gelli Plate. Fun textures are easy to find ... to get started, try using bubble wrap, plastic grids, foam stamps, stencils, leaves and string to create interesting imagery on your plate. For hand drawn mark-making, use soft-tipped tools like paint brushes, cotton tipped swabs or soft rubber-tipped tools. Splodge (technical term) your acrylic paint onto your surface and roll out with the brayer. Make your pattern marks. Put your paper over the top and smooth it on to take or pull a print. I smoothed it with the brayer and my hands. This was the print that I got through the stencil. I had cleaned my brayer off on a piece of cartridge paper. I put orange acrylic on the glass and pressed a piece of bubblewrap into it. I removed the bubblewrap and pressed the piece of paper onto the glass and took a print. And then it pressed the bubblewrap onto this printed paper. I sprayed ink and water onto the page to make the drips. And here's with added pink. On this paper I had put the yellow acrylic on the glass and then scribbled in it and printed. Then added the pink ink. And lastly I put some shades of red on the plate and made patterns with the brayer. Here's another print taken from the remains of the red using the second print from the photograph of the turquoise paint at the top of this page. You can keep building layers as long as the paper can take it. This cartridge paper was fine with the acrylic but didn't much like the spray inks and water. Mixed media paper or watercolour paper will give a different reaction. As for the Gelli Plate - well I'm going to a workshop with Dina Wakley at Art from the Heart in March to learn all about it - so watch this space to see if I'm a convert. Or an addict like Patti! 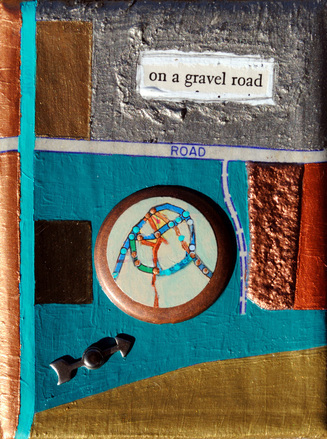 In Journal Candy this week the challenge was to alter a child's board book. And fortunately I had one stashed away that I'd picked up in a charity shop. It's approximately 5 inches square. If you go to Rachelle's page you can see a very short video of her book. I did all the inside pages with a selection of book paper, dictionary paper, a sheet of music, a page from a magazine and a map. And then put gesso over it. I stencilled with two Crafter's Workshop stencils: Butterfly Ballet and Vines using Dylusions spray inks - Bubblegum Pink, Fresh Lime and Lemon Zest. Dyan has some new colours out at CHA and I can't wait to get hold of the white. On the lefthand page I stuck down some paper napkin that Carolyn had sent me in an Advent Swap. And the yellow and orange acetate butterflies are from BJ in our January swap. The cardboard butterfly on the left was also from BJ and I used it elsewhere in the book to draw round before sticking it down here. I used another Crafter's Workshop stencil here on the left: Birds of a Feather. And another butterfly from BJ. Another paper napkin from Carolyn on the right. For the cover I glued scrumpled up tissue paper on and then put gesso over as the print showed from underneath. I stencilled with blue acrylic paint through a Tree of Life stencil and then inked all the edges of the cover and inside pages with Ripe Persimmon Distress Ink. I'm not so struck with the cover and wish I'd stuck with the method for the inside pages. I'm looking forward to seeing what Rachelle comes up with next week.